The Sistine Chapel ceiling, painted by Michelangelo in the Sistine Chapel between 1508 and 1512, at the commission of Pope Julius II, is one of the most renowned artworks of the High Renaissance. The ceiling's various painted elements comprise part of a larger scheme of decoration within the Sistine Chapel which includes the large fresco The Last Judgment on the sanctuary wall, also by Michelangelo, wall paintings by a team of the most highly regarded painters of the late 15th century including Botticelli and Perugino, and a set of large tapestries by Raphael, the whole illustrating much of the doctrine of the Catholic Church. Central to the ceiling decoration are nine scenes from the Book of Genesis of which the Creation of Adam is the best known, having an iconic standing equalled only by Leonardo da Vinci's Mona Lisa, the hands of God and Adam being reproduced in countless imitations. 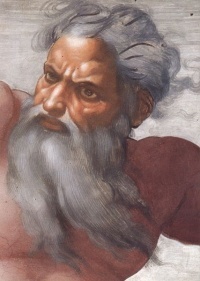 In many works, the painting of God and Adam are parodied. See The Creation of Adam for more. In the film 2012, people are praying under the ceiling. The ceiling then starts to crack. In Life After People: The Series, the Sistine chapel is seen falling after 500 years. Playwright Neil Simon's quote about the Sistine floor-"If no one took any risks, Michaelangelo would have painted the Sistine floor." Unless indicated otherwise, the text in this article is either based on Wikipedia article "Sistine Chapel ceiling" or another language Wikipedia page thereof used under the terms of the GNU Free Documentation License; or on original research by Jahsonic and friends. See Art and Popular Culture's copyright notice. This page was last modified 14:40, 19 April 2013.